Whenever a conversation turns to the 'best of all time' in anything, there's sure to be some feisty opinions. Now that the Famitsu Weekly readers have chosen their best racing game of all time, that's sure to get fans talking. The winner was Super Mario Kart, which saw off various rivals including plenty of retro games. There are some more recent releases in there, but it's clear that a number of Famitsu readers reckon racing games were better back in the day, a stance that has certainly prompted some interesting chat in our team. Check out the top 20 below, via JapaneseNintendo. What do you think of this list, and what is the best racing game of all time in your opinion? Let us know in the comments. But it's not even the best Mario Kart game. Nostalgia goggles lol. Never been a huge racing fan, but anything in the Mario Kart series is always a good time. Given the presence of multiple PowerPro games and Family Stadium, both (really good) baseball games, I have to wonder if this was more of a generalised "best sports games" list. Still, while it has been overshadowed by subsequent games, in my opinion, nothing quite compares to playing the original in glorious split-screen on a slightly janky 14 inch CRT; so I totally get why it has taken the top spot, nostalgia is a powerful drug. For a long time I still considered SNES Mario Kart the best Mario Kart until 8 came along. But I still have Sega Rally, Outrun and Daytona in higher regard. I've always preferred arcade racers to the realistic simulations. I loved Burnout Paradise on the 360. Of the Mario Karts, I always had great fun playing Mario Kart 64 with my siblings. My favourite Mario Kart is easily Mario Kart 7. Super Mario Kart is a terrible game by today's standards. Wrong. The best racing game ever is DiRT 2. Sega mega drives out run was/is great. Well, I do agree in parts: I think the Mario Kart SERIES are the best racing games of all time but not the SMK for SNES. Personally, I think MK8 (it doesn't matter which iteration - Wii U's or Switch's) are the best (by far). — You just can't surpass the fun this game can deliver --. Also, I think it adds to the point: in general, arcade games tends to be more fun than simulation games due to various details that only the pros of the pros can fully understand and truly enjoy. For the rest of us mere mortals who just wanna have some fun, they are normally just boring and skippable (being 100% honest here). Nostalgia blindness. I personally think Double Dash is the best entry in the series, and by extension the best racing game of all time. I presume Mario Kart 8 and Mario Kart 8 Deluxe are combined in this poll. And you know what? This is a fair result. Super Mario Kart was the original and did the racing and Battle Mode right. MK8 was missing a proper Battle Mode and MK8D is a lazy effort that does little bar righting a wrong that should have been fixed on Wii U.
I'm happy to see F-Zero GX get some richly deserved love. If it was me, I'd have it in the top 3. Super Mario Kart still looks and plays as beautiful as ever, it set a huge benchmark in gaming. I don't think it's dated, but each to their own I guess. Glad to see Kirby Air Ride make the list! Still hoping for a sequel someday! Too bad Double Dash or none of the Sonic & SEGA All-Stars Racing games made the list. Especially Transformed... great game, in my opinion! Needs Excite Truck, Wave Race 64, and Burnout 3: Takedown. Happy to see the Famitsu readers still remember F-Zero GX. Super Mario Kart isn't even the best Mario Kart. People can blame nostalgia and that may be somewhat true, but I think it's refreshing to see, as these kinds of polls are often equally ruined by people who just automatically choose the most recent one without giving it any thought. I remember a couple of years ago this site did a 'best Mario Kart ever' poll and with tedious inevitability Mario Kart 8 won by a landslide. Remember though, this was before MK8DX, ie. before they rectified the awful battle mode, so if all Mario Kart games are basically the same sort of thing, but this one has one key feature that's far worse than the rest, how exactly does that make it the best one? What these people do is mistake the question "What's the best Mario Kart game?" with "What's the most recent Mario Kart game?" thus rendering the poll useless. I would say it's the most fun racing game. I was on the Sega / Mega Drive side of the console war, my brother and a few friends had a SNES and Mario Kart was the only game to tempt me at the time. Spent many weekends playing it at my mates house. Original MK has aged poorly, but whatever. That is a seriously good list, it's awesome to see Daytona USA in at number 2. I'd probably put Mario Kart 64 above the original SMK and I'd like to have seen Wave Race 64 and Ridge Racer in there, but all in all it's pretty awesome. @Fazermint I hated double dash, probably because I liked SMK and MK64 so much, but I personally wasn't a fan of the changes made when it switched to double dash. I think that might have been when it felt really bad to play my favorite karter Bowser. SMK has definitely aged, but I still find it nastolgic. I still think MK64 is my personal fave though. @memoryman3 What's wrong with the graphics...?? Anyway, I don't like the series anymore, but I had fun with Super Mario Kart back in the day, which means by default it is the best one in the series. Anyway, that list sure is missing some good games, like Burnout Paradise, Star Wars Ep 1: Racer, WipEout, and Sonic All-Stars Transformed. @ACK Your comment reminds me of Burnout 2: Point of Impact. That was terrific. So many great modes and such fun with another player. Being a Western developed game might be why the Japanese aren't mad about it. Famitsu readers clearly know a thing or two about racing games! This list makes no sense. The third game is a baseball game. And if it's a best sport games list there isn't a single football game. I actually can't steer to save my life in Super Mario Kart. Never have. The D-Pad isn't that great of a control input for this type of game. I much prefer Mario Kart 8 Deluxe. I feel like it's the best the series has to offer. That said, I don't know if it would be considered the greatest Racing Game ever...I'm not sure Mario Kart would fall in that category for me, especially since I grew up on the Cruisin' games on N64. @A7XBlink182247 I don't know if that holds true after MK 7, but even though I always liked Mario Kart games, it was MK DS that made me adore them. EDIT: Oops, I though you had said DS, my bad. Why the three baseball games? Eh? EH?!? The only thing SMK has over the later entries in the series, in my opinion, is the lack of the Blue Shell (but then, the Thunderbolt is a bigger problem than that). Otherwise, I just can't go back to it anymore, especially since Mario Kart 64, Mario Kart 7, Double Dash, and Mario Kart 8 Deluxe happened. I don't think SMK is a bad game by any means (unlike Super Circuit), but it just hasn't held up its age well. After experiencing 4-player w/the N64 iterations and beyond, it's not so easy to go back to 2-player only Super Mario Kart. @SLIGEACH_EIRE Definitely. I give the nod to 3 for the awesome Takedown mechanic. Both are great though, and I'm still bummed that 3 never made it to GCN, since that version of 2 was excellent, certainly better than the PS2 version. Unfortunately it didn't sell with even the extra crash missions, smoother visuals, and lack of disgusting flickering. Glad to see Forza Horizon 3 there, deserves to forever be in a top 20 racing games list. @Krillin_ Out Run is awesome, but it was never meant to be a racing game, since you never actually race anyone other than a clock. It shouldn't even be counted. People, newer isn't always better. The latest game certainly isn't always the best one in a series. Every other Mario Kart game after the first Super Mario Kart mostly rely on pure luck and casual fun whereas the first one game is solemnly based on skills. If you can keep up the speed, know when to boost start, and know how to drift, turn, jump, and maneuver you can master the original quite easily. I remember thinking when MK64 came out that as excellent as it is, it lost a certain charm Super Mario Kart had and hasn't been recaptured since. MK8 is okay but it's very "flashy" (jazz music is for posers) and feels rushed (because it was, to get Wii U sales up). I can understand why SMK won the poll. Super Mario Kart is trash. I'd play any other game in the series over it, and plenty of other racing games in general. Bring Out Run 3D to the Switch please SEGA. Super Mario Kart doesn't really hold up that well IMO. My personal favorite Mario Kart games is Mario Kart DS. It paved the way for all modern say Mario Kart games, with both new (Nitro) and old (Retro) tracks, as well as online gameplay. Mission Mode was also pretty awesome, yet went missing in all future Mario Kart games. I hope that mode comes back in Mario Kart 9. @Boidoh Yeah, it's a good game in its own right but there are clearly a whole load of better racing games as far as I'm concerned. I'd personally place Sega Rally Championship* as my favourite racing game, at least in terms of single player racing. That game really is a pure joy to play, and today as much as ever. And even F-Zero on SNES is a better single player racer imo. But, I'm not upset at seeing Super Mario Kart on the top of the list; it's still a whole load of fun. Edit: Boy would I love a Sega Saturn Classic Edition with thirty of the very best games from the system pre-installed. Not sure about "best", but Super Mario Kart is where my love of the series started. Mario Kart 64 is where I became someone else..... something else. False. It's Mario Kart 8. Oh yeah, forgot about the Extra Cups. Never owned Super Circuit, and by the time I was considering buying it, Mario Kart DS had been announced. I concur. Still the best Mario Kart (it actually requires skill), and certainly my most memorable and fun racing game. Not in a world where Mario Kart 8 Deluxe exists. I think I could play time trials with Bowser blind folded! Strongly disagree with SMK being #1. No doubt it's an amazing game and probably the best SNES racing game, but overall? No, imo. I'd actually put all the newer MK games ahead of SMK with MK8 being my favorite and imo, best racing title ever. Wait what. Super Mario Kart?! I mean, it's great, but why would that be picked over any other Mario Kart, maybe barring Super Circuit (Although I did really enjoyed SC). Also, seeing Kirby Air Ride on there is incredible and really surprising. Although I kind of wish people would stop seeing it as a racing game and more as a... Well, I'm not sure what genre You would give City Trial, but it certainly wouldn't be racing. Mario Kart 8, as well as DS, Wii, Double Dash, 64, etc are definitely the better games but unfortunately a lot of people choose the first one as the best one because "it's the first one" these days. You have to take into consideration how the game was at the time when it was released. Super Mario Kart was far better in its time than any other Mario Kart game has been in their own since then. You wouldn't know unless you played it back then. It was something new and unique. That has never been the case with sequels and most likely never will. Also where's Burnout 2 and PGR? I love the first Mario kart, and the soundtrack is embedded in my brain forever, but project Gotham 4 still stands as my favorite racing game by a long shot. Not a huge fan of the original really because it frustrated me a lot more than any other Mario Kart game. I really wish we'd have another Diddy Kong Racing. Loved the adventure and exploration aspect to it as well as the boss levels and "magic codes" which really switched up the fun in multiplayer. Icicle pyramid with the "freeforall" code all the way. Super Mario Kart is outdated as hell. Sure it's fun, but the game didn't age well at all. While this list is quite a bit different than I would have ranked them. I played Super Mario Kart when I was younger, it was great fun but I still feel the others were better. Online play for me has really opened it up for me because I'm older now and my friends aren't really into gaming so playing against them isn't really a challenge. @MrGamerClock64 I agree, it's aged badly and Super Mario Kart can be incredibly frustrating at times. For some reason I seem to be not liking a lot of older games lately. There's no denying the contribution it brought, but nostalgia really gets in the way. The best racing game is without doubt is Big rigs: Over The Road Racing. What no Burnout 3 or Burnout Revenge!? Also I hold Mario Kart 8D, MKDS MK64, MK Super Circuit, higher than the original. Like what Memoryman3 said, Super Mario Kart feel slippery and out of control sometimes. It's a good game but I won't consider it the best. Racing games that need to be on this list! I'm confused. 20, 16, and 3 appear to be Baseball games..? Terrible list. Super Mario Kart has been outclassed by every subsequent release. Everything about Mario Kart 8 is better, and the worst part of the game is ironically the coin system they tried to implement, taken from Super Mario Kart. Kirby Air Ride undoubtedly got votes because it is an insanely fun and addicting game, although in no parts due to its actual racing. We'll probably never get the City Trial dedicated sequel we want. For me, Mario Kart 8 Deluxe is the Best in both graphic and gameplay. I honestly would've thought F-Zero GX would score higher. Swap Super Mario kart and Mario Kart 64 and that list will be more credible. Trackmania United Forever is the greatest racing game ever. @GravyThief I'm glad someone else thinks it's really skill based too. The items are only really small bonuses, unlike Mario Kart 8 Deluxe where you can get the bullet bill and autopilot your way. If a SNES game is the best racing game ever made, the industry has made zero progress since 1992. The correct terminology would be that SMK is their favorite racing game. There are objectively better racing games than this one, so it's absolutely not the best one ever made. That's ridiculous. If you think the controls are slippery then you are likely playing on an hdtv with too much lag. On a crt the controls are extremely responsive and accurate. No such thing as objectively the best video game. To claim otherwise is just an attempt to raise your opinion above others opinions. It was the most challenging of the Mario Kart series, and had the best one-on-one battle mode, otherwise it hasn't aged that we'll. DS remains my best. Overall best racing game I'd say Wave Race 64! Gran Turismo 2 the next best. We also shouldn't knock the nostalgia influence. At the time, SMK was a phenomenal game, and provided countless hours of fun. In that sense it kills many of the modern games because they are so easy. I breezed through MK8 Deluxe despite skipping the Wii and WU. If only the challenge from SMK could be reprised, I'd be ecstatic. Modern MKs stink when it comes to single player. Please, Nintendo, when the Switch online service launches, let SMK be something that we can play online! Oh, for next Mario Kart, I want to see something that founded on Chocobo Racing PS1. Imagine if we can collect 3 Mushrooms and become a Super Booster like Lv 3 Dash on Chocobo Racing or Change the Shells into like this : Lv 1 Shell = Green Shell, Lv 2 Shell = Red Shell, Lv 3 Shell = Blue Shell, so players can Always make Blue Shell by collecting 3 Shells. Replace the Banana with something slippery like Ice. Lv 1 Ice = 1 Slippery spot, Lv 2 Ice = More slippery spots, Lv 3 Ice = All players except the caster lost their control and Frozen for a while / "Explode" when bumping on something. I see a lot of nostalgia goggles this and that, Super Mario Kart is not a bad game and is one of the Mario Karts that actually needed skill driving to even be good at the game. The items were well balanced not like today and the mechanics are very solid to this day. There's also nothing wrong with the graphics either, still looks great and has aged well too. The only other games that even really needed skill to just drive in this series that I can think of are Double Dash and MK8 200CC. SMK deserves the spot it has on this list. I do wish Gran Turismo 2 was even on this list, and Daytona USA being there is a nice runner up. I don't think it has to do with nostalgia. People will pick the good games in the end. And SMK totally fits that. If we were doing top metroidvania games or something I don't think if Super Metroid showed up as #1 anyone would be saying it was from nostalgia goggles just because there are newer 3D games that some may think are better. In full agreement here, the original and still the best. Me and a friend still play this every week. I think I like Flatout 2 and ExciteBots better. Original Super Mario Kart is actually a terrible game that has aged really poorly. I was never really a fan of racing games until the modern era with true 3D based racing and higher frame rates. Even from that era, Outrun is more fun. Uhhhh... why are there three baseball (yakyuu) games on that list? Wondering why Jikkyou Powerful Pro Yakyuu appears twice on that list, as it's baseball! "Please note that Sports games were also included!" Wot. Why mix two unrelated genres into one list? I’ve played all versions of Mario Kart extensively and those that are saying the original hasn’t aged well really need to spend some more time with the game – it seriously is the best of the series. If you prefer that Zen like feeling when you’ve totally mastered something difficult rather than winning and losing being somewhat determined by luck this is the MK game – nothing more rewarding than nailing the handling on SMK. I do love all iterations of Mario Kart but since the Wii version it’s been more like playing poker the way the power up balance is programmed which can be super frustrating playing on line. No, it isn't! Best Mariokart is either Mariokart 64 or Mariokart Wii! @GrailUK hi, do you still have a PAL SNES console with Super Mario Kart? There is Worldwide Time Trial Competition heavily active on: http://www.mariokartplayers.com/smk/ if you know how to drive with Bowser you would be a great contender! @Interzone you have made the point perfectly Super Circuit had similar handling so i liked it as well, just a shame they added mushrooms in Time Trial mode which complicated the strategies further. @dew12333 thats great to hear, do you still play on the original SNES console? @Nashew apart from graphics and more tracks etc how are the later versions better than the original? I love how the series has evolved and that it continues to grow 25 years on. But i wanted to know why many feel that something about the new Mario Kart games really are better all round? @Boidoh I disagree, I think it absolutely is the best Mario Kart game. @BulkSlash WaveRace64 was seriously awesome. Too bad about the horrible sequel. @retro_player_22 This. SMK is the only one in the series with a huge skill cap and the potential to reach zen mastery levels of proficiency. For that alone it wipes the floor with it's successors - all fantastic games, still. @nsignific Absolutely, I was so stoked for Blue Storm that I imported a Japanese GameCube at launch, but it was missing whatever it was that made Wave Race 64 so awesome. @SamiCetinSMK I mean... you said part of it yourself, better visuals, more tracks, obviously those are good, but there's also more characters to play as, more options when it comes to kart customization, better music, it controls better, online functionality... those things are all MAJOR progress from a game made in 1992, thus making an objectively better game. Whether or not it's SUBJECTIVELY better is of course up for debate, but regarding all of those things, Mario Kart has come a long way. I legitimately do believe that quite a few SNES games hold up to today's standards. Yoshi's Island for example still looks and plays great today. But Super Mario Kart? Sure, the pixel art on the racers still looks moderately okay, but the physics? The weird pseudo-3D tracks? The games have come such a long way since then that while it subjectively holds up under the light of nostalgia to some, it really doesn't to someone who didn't play it back in the day (like myself). Super Circuit was great and yeah they messed with the time trials unfortunately. SMK time trials are amazing - so much skill required - I do love flying round Ghost Valley 1 with Kong, I can get pretty close to this YouTube guy but still a few seconds off. The physics of the game is actually one of the most powerful parts about it. A lot of people who hadnt played it back in the day say "the controls are terrible". But Super Mario Kart actually has a very simple system to manually hop jump and countersteer hop to keep on the precise racing lines that you want to, so you can drive pixel perfectly which can not be done in the same way on the others. True it wasn't proper 3d, the mode 7 engine gave the illusion of it. But for such an old machine and game to give that illusion and make it work was quite something. The generation gap will obviously make this divide and it will be hard for gamers to get into a classic title where the graphics are different and the game play to what they are used to today. My friend's son was shocked that classic games sometimes didnt even have a save function (though they are short games), and said he wouldnt want to play anything like that. 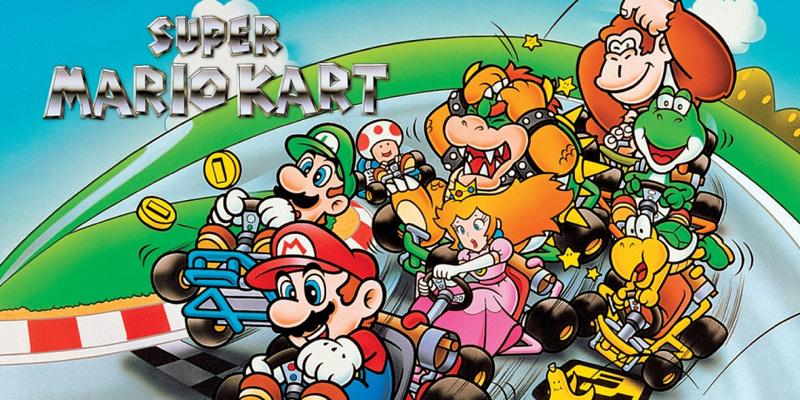 Super Mario Kart was one of the earlier SNES titles, so the graphics were a little simpler. Yoshi's Island was one of the later titles where after the DKC series they pushed the graphics more, a fantastic game which i really enjoyed too! More characters is great, but I realised, will i really use all of the characters, and all of the wheel / car types? Most of them are not good enough and only variations of the slick / monster wheels etc and certain cars are good. Just for enjoyment to use all the characters is nice, i like how they put Bowser' s kids. But it wouldnt make Super Mario Kart better if they had a DLC with 20 more characters either, as it is the play mechanics that is good. Music fine, that will improve over time. But online we have played for SMK for countless hours too, just not with a snes console, but by other means. We hope that Switch or the console after will provide this ability for SMK again. Yep still have a couple of PAL SNES's and copies of SMK - have every Nintendo system actually + SMK on VC and occasionally play the SMK rom on a PC online with a mate using 8bitdo SNES pads : ) Hopefully when SNES games drop on the Switch SMK will be included and have an online mode. Nice Ghost Valley time, you got skills - going to have a crack over the weekend. Sorry for slow reply but I'm on holiday and not been on. At the moment it's the wii u and the snes depending on where we are. I do like playing on the snes but it doesn't run the best on newer TVs and the controllers are getting on now, so often get blamed for a bad corner or something. I have so many versions of this game now and have just preordered the Snes mini and will only play kart on it lol. Tuesday, that's the ritual night out for a me and another beleaguered dad mate of mine, nothing has changed from when it came out really still sitting up till late at night playing match race, the only real difference now is that it's not winner stays on and happens on less nights a week. We've watched, and admired several of your vids actually and picked up a few things up. I just wondered what's your favourite track?